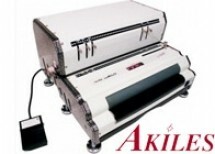 Akiles® is brand that is trusted by professionals throughout the binding and laminating industry. Their products are engineered to provide premium performance and trouble-free operation for years to come. Explore our selection of Akiles® products today to find top-of-the-line solutions for your business, organization, or school. Remember to sign up for exclusive email offers and take full advantage of our price-match guarantee on qualifying items. Their all-in-one electric coil, comb, wire, and combination binding machines are designed with busy homes, offices, and schools in mind. Combination comb punch and binding machines provide an affordable way to bind with plastic combs, making it quick and easy to produce professionally bound books. Compact machines also make it easier to save on valuable desk space. 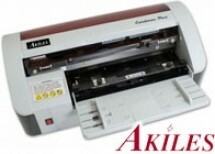 Their coil binding machines are perfect for individuals or small offices that bind at low volumes. Coil inserting machines feature silicone roller and stationary plastic rollers that work together to grip the spiral binding spine and roll it through the punched holes, which speeds up the binding process overall. Card cutting equipment is a perfect solution for small businesses with low-volume needs as well as large businesses who require the versatility to create an array of pre-set or customizable card sizes. One-pass cutting means that you only have to insert your sheet into the machine once to produce full-bleed cards of unsurpassed quality. If you’re looking for an electric or manual corner rounding solution, look no further. 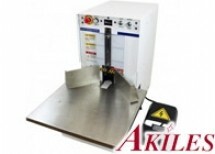 Our selection of Akiles® selection includes a wide variety of corner rounding machines and accessories to meet your needs. Desktop corner rounding machines offer electric action on a table-top level, so compact units work well in offices, print shops, photo studios and more. Manual corner rounding equipment is capable of cutting through a variety of materials, including paper, plastic, polyester, polypropylene, leather, and so much more. 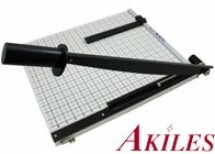 Fulfill all your paper cutting needs by exploring our selection of Akiles® products today. We offer guillotine cutting solutions for small stacks of paper and rotary trimmers for more precise paper trimming. 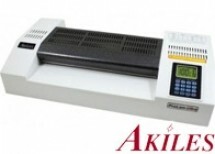 Akiles® pouch laminators are built to provide commercial-grade results. These laminating machines are optimized for photographs, allowing you and your employees to perform hard-to-laminate applications. Due to a patented internal cooling system, your new laminator will be cool to the touch even while in use. Economical models include a unique jam-release button that provides fast and easy jam prevention. Premium models feature large LCD displays with many features and memory settings that are easy to use. If you have any questions about our selection of Akiles® products, please contact us today to speak to one of our customer service representatives. Binding 101 is standing by to help. In a hurry? Chat online with a live specialist!